The older we get the faster the years seem to pass, and 2014 was no exception to that. Now 2015 is here, and no doubt lots of us have made a few resolutions. Although I'm not one for new year's resolutions as such, I do feel that the start of a new year is a good time to reflect on how the past year has been and how you would like the next year to be; as the saying goes, start as you mean to go on. I try not to be too strict in my resolutions as I feel we ought to allow ourselves a little room to breathe; the very definition of resolution is 'a firm decision to do or not to do something', but I think it's much healthier to set yourself goals or guidelines which aren't so specific - for example, if one of your resolutions is to give up unhealthy foods, perhaps set yourself the goal of cutting down on the amount of unhealthy foods you eat instead, or to try and increase the amount of healthy foods you eat. By being a little more forgiving with our resolutions, we are less likely to feel restricted by them and less likely to be disappointed in ourselves if we fall off track, which all in all makes us ultimately more likely to succeed. So with that in mind, these are the goals I've set myself for 2015. This is something I try to do all year round, but after the many indulgences that occurred over Christmas I feel that now is a good time to start over, reinforce my healthy habits and live even better than I did last year. This 'resolution' applies to all aspects of my life; from my diet, to fitness, to my headspace. My goal is to eat well and exercise often, whilst still allowing myself to indulge or rest when I feel the need, and to be more mindful, more present and more open than ever before. This is something I touched on quite recently, but I felt it needed a mention here as well because it's one of my main goals for 2015 and beyond. As well as improving my content, I also want to get a little more organised, planning posts and taking photos for them in advance, scheduling posts for times when I know I'll be busy, being more consistent with the days I post on, and just generally being a better blogger. I'm beginning to find my feet and am starting to get an idea of the sort of content I want to produce and the level I want it to be at, and I'm excited to share the new and improved Namaste, Rowan with you guys. This is also something I've written about before, and although I wouldn't say I was at all ungrateful, lately I've been less actively grateful than I used to be, so another of my goals for this year is to give more thought each day to all I have to be grateful for, and to truly appreciate each of those things, no matter how big or small. When I get caught up with work and lose myself in a to-do list which seems to go on forever, I tend to forget to make time for the important things, and that's something I really want to change. So, from now on, no matter how busy I am or how many things I have to do, I will make time for those important things like family phone calls or meeting up with friends, and not let that niggling voice in the back of my head telling me I should be doing something else talk me out of it. This kind of combines all of the points above, so I suppose in a way I ultimately only really have one resolution this year; to live a life full of adventure, joy, health, good company, opportunities, love and good energy, and I wish you all the very same. 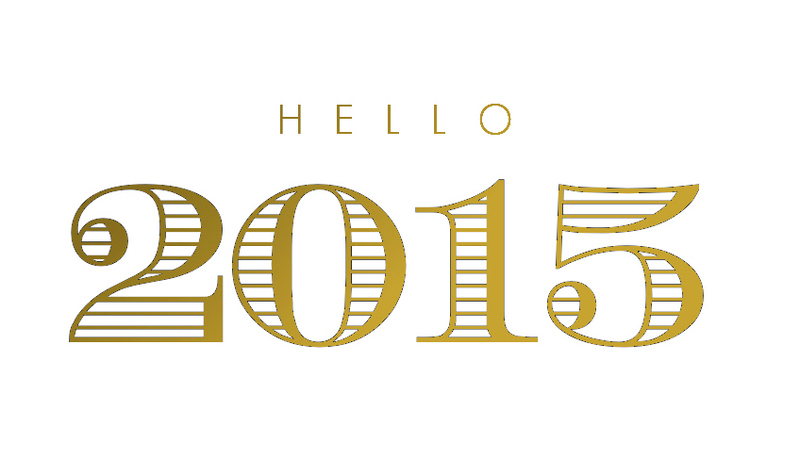 I hope 2014 was a great year for you, and I hope 2015 is even greater.